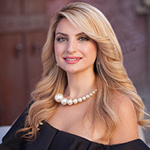 We are pleased to have chosen Mimi Nassif as our realtor because she is able to answer all questions on the spot. She is polite and understanding which showed us how much she respects her clients. I felt comfortable with her. She was also flexible, meeting with our family at any time we were available. She was also amazing negotiating for the home we wanted since we had a limit on the amount we could pay. The best part of the client relationship we have with Mimi is that even after the closing of the contract, she has continued to help us getting us in contact with her network of contractors and other professionals in the area. I appreciate her care and thoughtfulness since we are new to Roseville and would not know who to hire to do work on our home.